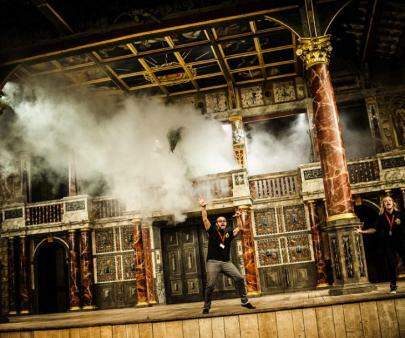 Experience the magic of the Shakespearean stage as a family at the Globe Theatre Exhibition and Tour in London. From stage fighting to period costumes, you'll be able to immerse yourself in Shakespeare's life, times and plays, and learn a few famous quotes too! 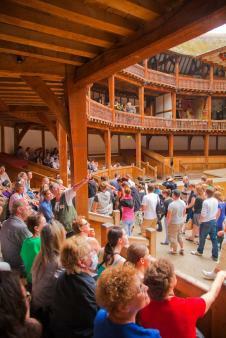 To be or not to be… a guest at the fabulous Globe Theatre Exhibition and Tour on London’s historic Bankside. For Shakespeare fans aged 7 and over, it’s a no-brainer, the perfect place to discover all about one of history’s most famous writers. Dominique Dinse visited with Oliver, 10, and Ben, 9. Far from a dry text in a dusty classroom, the magical space of London’s Globe Theatre brings alive the words of one of the greatest writers in English history. The theatre was the vision of US playwright Sam Wanamaker who, on a visit to London, was astonished to find nothing but a bronze plaque – with incorrect dates to add insult to injury – marking the location of one of the greatest theatres in history. Rebuilding the Globe became his life’s work and it was opened in 1997, four years after he died. The magnificent oak and thatch theatre shows Shakespeare’s plays in the open air and attracts visitors from all over the world. Just as mesmerising as the action on stage is the adjoining Exhibition space. Of the many attractions for kids in the capital, this is not the one to take littlies to. While older children are amply catered for and will get a lot out of the displays and costume and stage-props demonstrations in the Exhibition, and be able to ask plenty of questions on the tour, tiniest visitors will not find enough hands-on activity to keep them interested. That said, if you have a buggy-bound toddler or baby tagging along with older siblings, the museum is extremely accessible and easy to get around. By far the best way to whet future theatre fans’ appetites is a fantastic new online resource that brings the world’s most famous theatre alive for 5-11-year-olds. 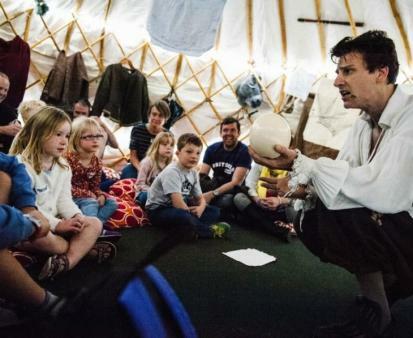 The Globe Playground is a great way to introduce children to Shakespeare and his stories as you join Hemmings the Bear and his company of players – Condell the Stag, Dekker the Dog, Kit the Cat, Perkins the Shrew and Slye the Fox – as they go behind the scenes at Shakespeare’s Globe. You can solve puzzles, read fun facts, quizzes and short stories about life at the theatre and watch how costumes and props are made. There are also fun activities to print, colour, craft and even bake. For 7-12-year-olds, the Exhibition’s thoughtfully curated displays will really bring to life the Bard, his world and his writing. A wealth of fascinating facts is presented in a hugely entertaining and accessible way, all around the walls, on two floors, of this amazing space. Everything from the world Shakespeare wrote in – with maps and architectural treasures from historic Southwark – to the words from his plays and colourful details about his life is made accessible to visitors. While much is behind glass, there are hands-on opportunities in the form of touch screens showing what life was like in Tudor times and giving you the chance to do fun stuff like playing Elizabethan instruments such as lutes, recorders and viols. There are also interactive booths where you can listen through headphones to Globe founder Sam Wanamaker quoting Shakespeare. A brilliant way to get the most from the expanse of information is with an audioguide, free with your entry ticket. This lets you explore the displays at your leisure and if your browsing is interrupted by a tour, you simply hand it in, then collect another one when your tour is over. Another hugely entertaining innovation is the Family Trail, given out free to all young visitors. With this, you work your way around the Exhibition, filling in answers in a fun quiz. What wood is the frame of the Globe made out of? What is a farthingale (hint – it’s to make your bum look big)? And what was the name of the acting company Shakespeare joined in 1594? You’ll find the answers to all these questions and more as you make your way around. The tour! There’s one every 30 minutes and when you arrive you’ll be booked in on the next available one. These typically take up to 20 people, giving you ample opportunity for a close-up look at one of the world’s most famous theatres. While you can’t actually set foot on stage (this privilege is reserved strictly for the actors), there’s plenty of opportunity to pose for photos in front of the richly painted stage and on the seats surrounding it. Each tour is led by an expert guide. One little warning: pre-booked school groups will have a tailor-made talk and tour but if you’re a family group visiting with children, just have a quiet word with the guide beforehand to ensure that no fruity details from Shakespeare’s time leak inadvertently into the conversation (you'd probably rather not find yourself fielding uncomfortable queries about the violence in Titus Andronicus or questions like: “What’s a prostitute, Mum?”). Hands-on demonstrations bring the world of the theatre to life. When we visited in the half term there was a thrilling display of choreographed fighting with swords and staffs by young actors in training for actual on-stage action. Close-up inspection afterwards – with plenty of time to pose for photos with the props and the actors allowed – revealed these to be very heavy and realistically businesslike enough to the require the actors to hold a hand over the sharpened tip as young visitors got hands-on with them. We also enjoyed a costume demonstration in which a member of the audience was selected to be dressed as Ophelia in the many layers of historically accurate stage clothing, as would have been used in Shakespeare’s time. An eye-opening and hugely entertaining glimpse of the skills used backstage at this world-famous theatre. If you’re packing a picnic, head straight for a spot by the river so the kids can explore and play. It’s easy to duck in and out during a visit – just show your ticket when you come back in. For a special occasion, or for a quieter experience than the riverside tourist bustle, the Swan Bar & Restaurant serves modern British favourites in a beautiful, naturally lit dining room looking out over the Thames to St Paul’s beyond. There’s no kids’ menu but family friendly choices include salmon and smoked haddock fishcakes for £10.50, shepherd’s pie for £11.50 and fish and chips for £14.50. Lighter options are on offer at the Foyer Café Bar – soup of the day for £3.50, sausage rolls and pasties for £4.50 each, croque monsieur for £4.50 and pastries for around £2 each. Getting to Bankside with kids is a relatively stress-free journey as everything is so well signposted. The Globe is about 10 minutes’ walk from Blackfriars and Rail stations and just over the river from Mansion House on the District and Circle Lines and St Paul’s on the Central Line (15 minutes’ walk). By far the most fun way to arrive at Bankside is by Thames Clipper. These sleek, modern vessels speed you along the Thames, giving you a seagull’s eye view of all the famous sights along the way including the London Eye and Big Ben. Arriving with a baby in tow couldn’t be easier – the boats are happy to take buggies on board and Bankside Pier is 10metres from the Globe Theatre. Boats arrive and depart every 20 minutes. For timetables and routes, visit thamesclippers.com. Admission prices: Tickets are £13.50 adults, children 5-15 years £8, students £11, under-5s free. Family ticket (up to 2 adults and 3 children) £36. And if you’re under 15 and hold a Blue Peter badge, you get in free! The Globe Theatre Exhibition and Tour is open daily (except 24 and 25 December) 9am-5.30pm. Globe Theatre tours depart every 30 minutes and run Monday 9.30am-5pm; Tuesday-Saturday 9.30am-12.30pm; Sunday 9.30am-11.30am. Times apply until 18 October 2015. Tudor treasures can be purchased from as little as 50p in the brilliant shop which has a special section for kids’ gifts. Souvenirs emblazoned with the Globe’s name include badges for 60p, erasers for £1, pens for £2 and keyrings for £2.50. There are also themed goodies from the Bard’s most popular plays, so you can buy a badge with Yorick’s grinning skull on it or lip balm with lovey-dovey quote from Romeo and Juliet. Favourites with our boys were quill pens made from real feathers and sold with real ink (for £5 each); £1 bookmarks with Shakespeare’s quotations – Oli’s favourite was one saying: “Here villain; drawn and ready. Where art thou?” Also a big hit were handmade wooden daggers for £5 – far less dangerous than the big metal ones on display inside – and a £3.99 book of Shakespearean insults. Weeks later, our 2 boys are still shouting out randomly: “Thou hast no more brain than I have in mine elbows!” and “You peasant swain!”. Mums and dads will love all the Shakespeare-themed books. Best of these is the brilliant Usborne Illustrated Stories from Shakespeare for £16.99. There’s also a brilliant £14 Brainbox family game for ages 8+ – the perfect present if you’re looking beyond Minecraft and Lego for an entertaining birthday or Christmas gift. The Globe Theatre’s fabulous website is a gift for teachers who will revel in the wealth of information on tap and a great help to 21st-century students stuggling with the language and literary devices used by this most brilliant writer. Available for free download are fact sheets about everything from Shakespeare and his life and time to the history of London and its playhouses, and all aspects of theatre, from writing plays to the special effects, costumes and cosmetics used on stage. You can also look at photos from past productions and listen to sound clips of actors talking about what it was like to play in such iconic surroundings. Students looking at Shakespeare for the first time will find the website a great help. 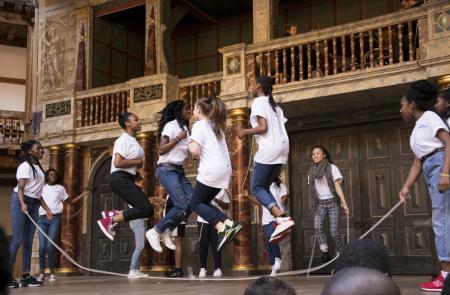 The Globe’s acclaimed Playing Shakespeare series features 100-minute fully-staged versions of the plays specifically for Key Stage 3, 4 and A-Level students. On the website at the moment are Romeo and Juliet, Othello, The Merchant of Venice and A Midsummer Night’s Dream – all with helpful glossaries, a guide to the characters and a fantastically helpful scene-by-scene walkthrough of the play with easy-to-understand synopsis.